No matter the project—replacing a roof, relocating light switches, repairing broken pipes, building an addition—you want to hire the best of the best. 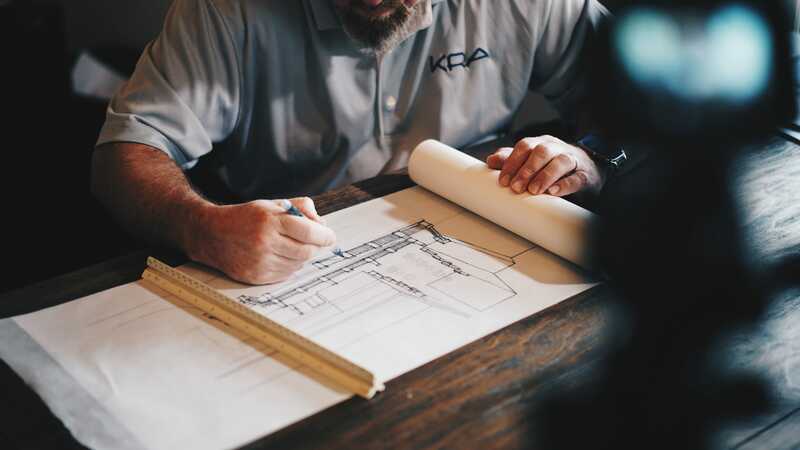 Avoid the hassle and stress of handling a project on your own by hiring a contractor, but make sure you plan properly and do your due diligence to find someone who suits your needs. You also want to avoid the horror stories you hear on the news about contractors scamming homeowners out of money. But finding a contractor is more difficult than it sounds. Just flipping through a phone book and hiring the first electrician you find can result in disaster. Luckily, we’ve compiled some tips to help find the most valuable company for your needs. Stick with local businesses. These companies typically already have a good reputation in your area. You’ll likely run into someone who has used that local company or maybe you’ve even heard of them before you started searching. It’s also important to have someone nearby in case you have questions or concerns about your project. Hiring a local contractor also means there’s less of a chance they will pick up and leave, scamming you out of big sums of money. Ask friends and family for recommendations. Ask people you know if they’ve ever done a similar project to yours or hired a contractor in the specialty you’re looking for. Word of mouth is one of the best ways to find reputable companies. Leverage people you know and ask questions about their experience. Did the contractor address your concerns in a timely manner? Were their employees generous and hard working? How much did the project cost? Was the work completed on time and on budget? Conduct interviews and meet fact-to-face. If you want to be thorough, there’s nothing wrong with setting up a phone or in-person meeting. Making sure they can answer all your questions is important. And as superficial as it may seem, sometimes appearance can make or break a deal. A messy truck may be a sign of disorganization. A sloppy look could be a sign of sloppy work. However, don’t put all your eggs in that basket. It’s only one facet of your search. Have a clear vision for your project. If you’re short on details, you’ll likely get a large variety of answers from the contractors you’re considering, which will make your decision even more difficult. If you know exactly what you want, you can line up each company’s answers and estimates to make a more informed assessment and you can break down the cost of every single line item side by side. Get everything in writing. Estimated schedule, projected cost, labor rates, materials used, etc. should all be outlined in writing. That way you have proof of everything the contractor has promised to you. Additionally, if any changes are made throughout the duration of the project that conflict with the original quote, make sure they are outlined in writing and approved as well. Confirm your point of contact and who is doing the work. Who do you call when you have a question or something goes wrong? Don’t get the run around from the contractor. There should be one person who can answer all your questions thoroughly. You also want to confirm that that contractor will indeed be doing the work themselves. If not, make sure they disclose all subcontractors to you. Price should only be one factor of many. It’s not wise to focus solely on the cost of your project. Choosing the lowest bidder may mean the company doesn’t use quality materials or employ qualified workers. If you’re happy with the answers and contract the low bidder gives you, then hire them. But you may be better off going middle of the road or choosing the priciest contractor, as they are more likely to be superior to their competition. Ask the contractor for references. If you can’t find someone who has experience with the contractor, ask them directly if you can talk to previous customers. Just like a human resources director investigates a potential employees’ experience, see if the contractor can provide you with positive stories from past customers. Check for reviews online. This tip can be a bit tricky, as anyone and everyone can leave a review online these days and it may not always be an accurate reflection of the company. However, it doesn’t hurt to do a little bit of research before reaching out to a contractor. Don’t be turned off by busy companies. The fact that a contractor has a busy schedule is probably a good sign. They’re in high demand so customers must be big fans of theirs. If you’re not in a hurry to complete your project, be patient and follow their busy schedule. Do not pay up front. A good contractor likely won’t ask for payment before work begins. A deposit may be required for good faith, but you should receive a bill at the end of the project for the remaining balance. A big red flag is when a company asks for full payment in advance. Don’t limit yourself. Whether you want to interview two plumbs or ten plumbers, that’s your preference. Keep searching until you’ve found a contractor that makes you comfortable. A good company will respect your due diligence and patiently wait for your business. Ask for the company’s credentials. If you want to be extremely careful, you can always ask the contractor for credentials, such as their business license, insurance policy, warranty information, and permits. A good company shouldn’t hesitate to provide proof that they’re an established, legitimate business. Check their safety record. One of the most important factors in hiring a contractor is making sure the contractor is safe. Employees should wear proper protective equipment, unsafe areas should be cordoned off, and there should be proper procedures and policies in place in case there is an accident. The last thing you want is an injury that can throw off the entire plan or cost you’ve formulated for the project. And every contractor should be able to send their employees home in the same condition they came to work. Your advice to interview and meet with potential electricians to ask questions and check their communication is a good idea. This could also help you figure out if you trust and are comfortable with them. It might also give you the opportunity to discuss the electrical repairs and other services you require in order to determine which one can best handle the work.